Second Glass Turns Busted Windshields Into Decorative Windows And Doors | OhGizmo! Well here’s an interesting way to recycle and re-use. 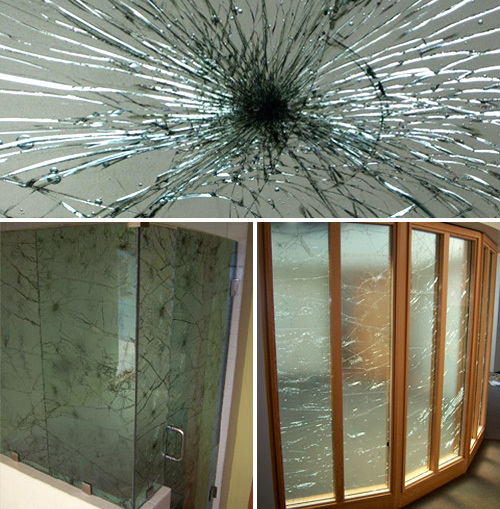 A company called Second Glass actually turns shattered windshields into everything from shower enclosures, to office walls, to even decorative lighting. While their website doesn’t go into the details about their patent-pending process, the windshields can be tinted to match any existing decor, and the recovery process is a lot easier on the environment than the production of new glass. On top of that, it’s one less thing going into a landfill. Now the random cracks and spider-webbing definitely have a unique look to them, but I think I’d constantly be wondering about the circumstances that led to the windshield getting shattered in the first place. Presumably, they don’t come with a backstory. Wow! That's really beautiful. I just love that windows-walls on houses.